Are you thinking about buying a Canon Pixma MX882 Wireless Office All-In-One Printer and wondering if it will work with your Ubuntu computer? Although Canon does not make this clear in any way, the answer is YES! Instead of using software that comes on a CD with the printer, you'll have to download and install drivers yourself. They are not easy to find if you live in the US since they're only available on European and Asian Canon websites. I'll tell you how to download and install them. Visit the Linux IJ Printer Driver page on the Canon Europe web site. Click the Linux IJ Printer Driver MX880 series.tar link in the Downloads section to download the 7299.5 kb tarball. Inside the tarball, find and unpack cnijfilter-mx880series-3.50-1-deb.tar.gz. Inside the resulting cnijfilter-mx880series-3.50-1-deb/packages directory, locate and double click cnijfilter-common_3.50-1_i386.deb and cnijfilter-mx880series_3.50-1_i386.deb in that order. Ubuntu will guide you through the installation. Note: The guide that came with this driver asks you to run the install.sh program, but it didn't work for me. When I ran it, I got an error: An error occurred. The package management system cannot be identified. From Ubuntu's menu, select: System, Administration, then Printing. 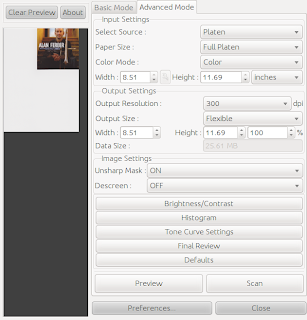 From Printing window that opens, select Add. After a few seconds, you should see a Canon MX880 printer show up under Network Printer. Select it and click Forward. Finish entering your printer Name, Description, and Location. Visit the Linux IJ Scanner Driver page on the Canon Europe web site. Click the Linux IJ Scanner Driver MX880 series.tar link in the Downloads section to download the 3072 kb tarball. Inside the tarball, find and unpack scangearmp-mx880series-1.70-1-deb.tar.gz. Inside the resulting scangearmp-mx880series-1.70-1-deb/packages directory, locate and double click scangearmp-common_1.70-1_i386.deb and scangearmp-mx880series_1.70-1_i386.deb in that order. Ubuntu will guide you through the installation. I have not yet figure out a way to use the scanner via XSane. I'd love to hear comments about whether this is possible and how to do it. Without XSane support, I can't use familiar programs such as SimpleScan and gscan2pdf. One more thing to mention. Before I figured out Canon made drivers for this scanner, I came across a program called VueScan which claimed to support MX880 series printers on Linux via the network without installing any drivers at all. It took seconds to download, launch, and see that this program could communicate with my MX882 scanner with ease! It may be worth the $79.95 if you can't get Canon's drivers to work. Happy printing, scanning, copying, and faxing! Big thanks! Exactly what I needed. You save me a ton of time. You instructions work on Ubuntu 11.04. Fantastic! Thanks for posting this. I too used this on 11.04 and it was perfect. Thanks a lot dude :). I spend a lot of time to find help with this issue. I almost freaked out when I wanted to download the Linux driver for the Canon Pixma MX885 from Canon's homepage. They were not available. WTF? At least I found your page. Now everythings fine. Thank you, thank you, and thank you again! I followed your meticulous instructions and my download/driver install worked PERFECTLY. You made my day! This works with Fedora too, if you use the regular rpm files. Works perfect for Linux Mint 11. Thanks for locating the drivers. it works prefectly on 10.10 and saved me a lot of time! Works perfectly. Thanks. Now, how do I open the User's Guide? It's downloaded and extracted, but I can't figure out the command to view it. Great help finding the drivers. BTW, the install.sh command is to be typed in the terminal preceded by a sh command. So we just need to extract the folder somewhere, access that folder in the terminal and type 'sh install.sh' once in the folder. Perfect. Works on Ubuntu 11.10 like a charm. Thanks so much for posting this. This was very helpful, got it working in just minutes after reading this page. Weird that Canon doesn't publish the drivers on their US site, but hey, the links on your page worked fine. Have you been able to find out the IP address of the printer? I would like to use it over the network and unfortunately have no way of telling what IP address it was assigned. Thanks Helped me much, BTW install.sh worked just fine for me! Thanks Ken! This appears to have worked perfectly. Even the install.sh's worked for me. Printing is now working and I haven't tested scanning yet, but the software is installed. thank you so much for your post. i was able to get this printer to work. Your link to the driver downloads and installation with and without script worked fine. Thanks! Is there a way to print in using only black ink? I've looked in the printer properties for a way to print in grayscale or "just black" when you don't want to print in color. The printer properties seems to only offer RGB under "Printer Options/Printer Model"
Many thanks! Your instructions are clear and complete! Both scanner and printer now work! BTW, if someone isn't able to make the Canon linux drivers work, TurboPrint is a reasonably inexpensive driver set (around 40 USD) that also allows you to see ink levels, etc. Works on LinuxMint 11, thanks! The script (install.sh) worked fine for me when run in a terminal window. i use Ubuntu 11.04. i downloaded the package but when i double click cnijfilter-common_3.50-1_i386.deb or cnijfilter-mx880series_3.50-1_i386.deb i received an error message "item cannot be installed or removed until package catalog is repaired" i hit the Repair button but the problem is not solved and i receive another error message. Big thanks from me too... Thinking to look on on European or Asian links will probably pay off for other things as well. Thanks for the help and the tip. and can now scan from my MX882 using SANE. This tutorial is fantastic. I was having such trouble transitioning from my MX860 to the MX882, but you made it a breeze! Many thanks for the detail and clarity! Thanks for this, worked perfectly for me in Kubuntu 11.10. The install shell script for the scanner must be fixed because it worked for me. Thanks for your instructions. Worked like a charm! Hi Ken, thank you very much for helping to find these "hidden" drivers and your description for installation. Works great with my MX885 on Ubuntu 11.10.
ran the script, and moved rpm back after. Thanks for the tip on where to find the driver in the first place! Works well but cannot get it to print landscape mode. any number of times when I load a new distro and can't print or scan on my MX882. MANY THANKS! I am just getting started with LINUX and was at wits end trying for days to use wireless printing on my Ubuntu 11.10 laptop with my Canon MX882! Everything I tried was unsuccessful and I had almost given up when I stumbled upon your info. Downloaded drivers, ran install.sh (worked for me) and I was printing in about 20 minutes! Again, many thanks! Ken thanks for your input with this I can confirm that this process works with Ubuntu 12.04 also. This worked wonderfully, thank you so much! After having my printer for a year, I am finally able to not have any reason for a Windows partition! I would like to add something - the user *must* first set up their wireless on the printer before following these instructions. Your instructions are MUCH appreciated, worked with 11.04, THANK YOU! Thanks a ton Found this before but your instructions totally clear up the ambiguity in the install. Really helpful, thanks so much for putting these instructions together. This was great help for me. I had the script error and typed in the bit about "
This is awesome! Thanks so much Ken. I am a complete noob to Ubuntu and I was able to get my MX882 running with your instructions (Scanner too). I am using this on Unbuntu 12.10 64 bit and to avoid hassle I used the 32 bit drivers. No errors during the whole process, including the install.sh. You're a lifesaver man. Awesome! Thanks a bunch. Just installed on Ubuntu 13.04 with not a whimper of a problem. Works on ubuntu 12.04 as well! Thanks a lott! "i use Ubuntu 11.04. i downloaded the package but when i double click cnijfilter-common_3.50-1_i386.deb or cnijfilter-mx880series_3.50-1_i386.deb i received an error message "item cannot be installed or removed until package catalog is repaired" i hit the Repair button but the problem is not solved and i receive another error message." This happend to me too until I realised that my ubuntu is a 64bit version. Embarrassing! Just try the appropriate drivers and it will hopefully work. Thank you! I had hit a dead end on the US Canon site, but now have my MX882 connected to Debian 7.1. Anonymous, sorry, I just saw this (setting up the same printer again -- not sure what happened to the original settings).